One hour remains in the search for the victor of the 2017 Liqui-Moly Bathurst 12 Hour after an intense ten hours of running today. 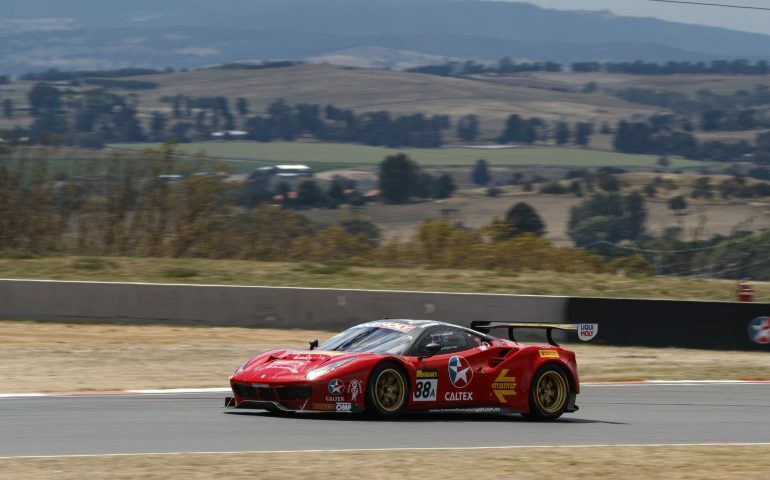 Maranello Motorsport continues to lead in the #88 Ferrari as the Liqui Moly Bathurst 12 Hour starts its final hour. Leading the classes are #88 (Liqui-Moly GT3 Pro-Pro), the #12 Competition Motorsports powered by Ice Break Porsche (BRM Watches GT3 Pro-AM), the #912 Walkinshaw GT3 Porsche (Rydges Bathurst GT3 AM), the #21 Steve Richards Motorsport Porsche (myPlates Class B GT3), the #91 MARC Cars Australia Focus V8 (Racer Industries Class I) and the #19 PROsport Performance Porsche Cayman PRO (Avis Class C). Hour ten began under safety car, with the #88 leading with Toni Vilander at the wheel from Patrick Long in the #12 Porsche, Maro Engel of the #22 Mercedes-AMG Team STM/HTP Motorsport Mercedes AMG and the #17 Bentley Team M-Sport Bentley Continental GT3 of Oliver Jarvis. The race was restarted at 2.56pm, with the #1 Tekno Autosports McLaren piloted by Alvaro Parente doing all its can to get back on the lead lap with just two cars between him and race leader Vilander. Losing a lot of time on the restart was the #912 Walkinshaw GT3 Porsche, replacing brake pads and discs under the safety car but failing to complete it before the green flags flew. It would return to the track in fifth position. Whincup took over the Ferrari and continued the work of Vilander, working hard to move his way back up the field. It wasn’t nearly all that simple however, with a dicey release from the #83 HTP Motorsport Mercedes AMG seeing Vilander forced to avoid on his way to the pit box. Whincup returned the Ferrari to the track in third position, chasing behind new leader Patrick Long in the #12 and second placed Maro Engel in the #22, and ahead of the #912. At 3.36pm, Long pitted from the lead and handed the #12 over to Marc Lieb, with Engel taking over the lead in the #22 while the #17 moved up to third. Come 3.49pm, the #22 pitted from the lead and handed over to Shane van Gisbergen, who re-joined in third position behind new leader the #17 and the #88, and ahead of the #12. Soon, it was time for the #17 Bentley to pit – Steven Kane took over from Guy Smith with 1h 50m remaining, unfortunately the entry would lose 15 seconds in the pits when the car failed to fire. Regardless, the #17 returned to the track in fourth position to take up the fight once again. While continuing to build a lead over the #22 of van Gisbergen, Whincup had hearts in mouths at 4.10pm – running wide on the Caltex Chase. Luckily for the Ferrari racer, he was able to gather it back up and return without issue. At 4.37pm, Marc Lieb was coming close to his maximum driving time and so came to the pit lane to hand over the #12 to Matt Campbell, who returned to the track in fourth position behind the #17 Bentley. After hopping out of the car, Lieb reported that the #12 will now be able to finish the race without any further stops. However, tragedy then struck for the #12, incurring contact at Virgin Australia corner from the #32 JBS Australia Lago Racing Lamborghini. Both entries were able to resume, however the #12 had damage and was forced back to the pits, dropping it further away from the leaders. As the clock approached the beginning of the 12th and final hour of this race around the clock, Whincup and the #88 lead the second-placed #22 by 30 seconds but the New Zealander was showing no signs of giving up in his chase of the Gold Coaster. At the same time, questions remain over how many stops the #88, #22 and #17 need to make it to the finish – setting up an epic battle for the final hour of this race. Also attracting attention was the #48 Interlloy M Motorsport KTM X-Bow, with a small fire under the rear for a number of laps which thankfully was resolved without incident.